The Tax Policy Center (TPC) today released a new dynamic analysis of the House-passed Tax Cuts and Jobs Act (TCJA), adding more proof that tax cuts don't pay for themselves. While thoughtful tax reform can substantially improve economic growth, TPC finds that much of the economic benefits of tax reform will be offset by the negative economic impact of adding over $1.5 trillion to the national debt (after interest). All told, TPC estimates the House tax bill will increase Gross Domestic Product (GDP) by 0.3 percent after a decade, meaning that it would increase economic growth by 0.03 percentage points per year. That is less than one-tenth of the 0.4 percentage point growth boost that some policymakers have claimed could be achieved and an even smaller proportion of the boost that the Presidential and Congressional budgets have assumed. TPC’s model – which is in many ways similar to the model used by the Joint Committee on Taxation (JCT) and other official scorekeepers – finds that the faster growth the legislation would produce would result in $169 billion of dynamic feedback in the first decade. This is only a fraction of the $1 trillion of feedback many policymakers have claimed is possible and would leave the legislation costing nearly $1.3 trillion over a decade. Importantly, TPC’s estimates are far from unique. No credible models to date that account for the economic effect of federal debt have found the House or Senate tax bills would increase growth by anywhere close to 0.4 percent per year. 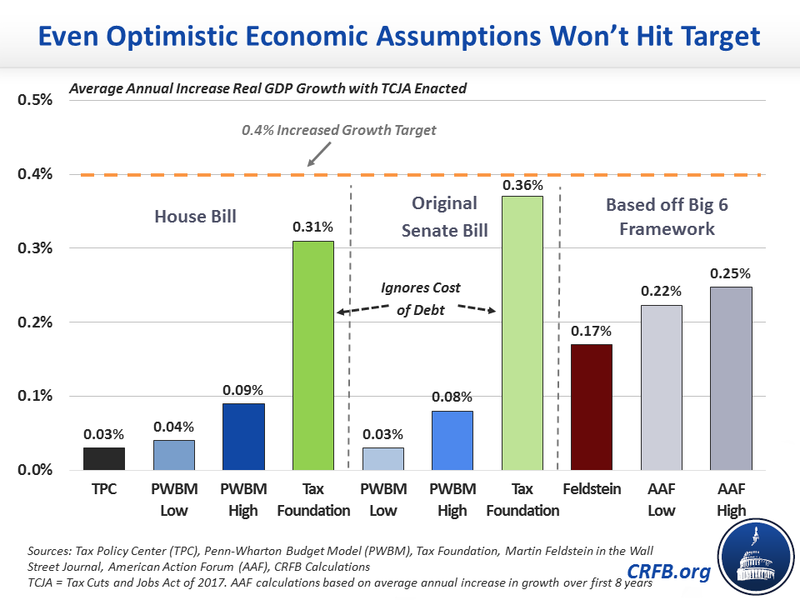 The Penn Wharton Budget Model (PWBM) found that the House and Senate bills could improve annual growth rates by anywhere from 0.03 to 0.09 percentage points. Economist Martin Feldstein estimated a generic tax reform package might improve economic growth by 0.17 percentage points per year – and it is not clear his estimates incorporated the negative effects of debt. Additionally, a study from the American Action Forum of their own tax plan based on the original Unified Framework found growth could improve by 0.22 to 0.25 percentage points per year,* assuming higher deficits were ultimately offset with future tax increases or spending cuts. Only the Tax Foundation estimated a possible growth rate increase anywhere near 0.4 percentage points per year. Importantly, this estimate is of the original Senate bill before growth-stunting expirations were added. More importantly, the Tax Foundation model assumes tax reform will have an unusually large effect on investment, and they assume no economic cost of debt. Even their own critique of “crowd out” admits there is some cost to higher debt, and the studies they cite suggest that cost is significant. While it is true that tax reform can improve economic growth, tax cuts that add to the debt will suppress that growth. Tax cuts don’t pay for themselves, and both the House and Senate tax bills would impose a large debt burden on future generations. * This calculation was done as the average annual growth increase over the first eight years of the proposal. American Action Forum provides a second five-years growth effect, which we assume is the effect in the eighth year. All other calculations in this blog are over the first decade.